I had to share this blog with you. 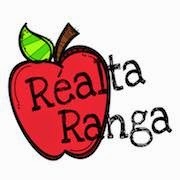 Réalta Ranga is a brand new source of teaching resources and ideas from a teacher in a gaelscoil. This teacher has experience with both the upper end of primary school as well as the infants. Posts are written as Gaeilge and in English so it's great for those of you who want to do some light reading to keep up your scileanna as Gaeilge. They (sorry, I don't know your name!) also have a TPT store, Facebook page and a Pinterest profile for you to check out. This new blog has gotten off to a very promising start!